I'm impressed with this hairspray but as a medium hold spray. It does not provide the extra strong hold advertised on the bottle - it's ideal for daytime wear to work but wouldn't be enough to hold an up-do. The gorgeous scent makes up for its slightly lacking hold. 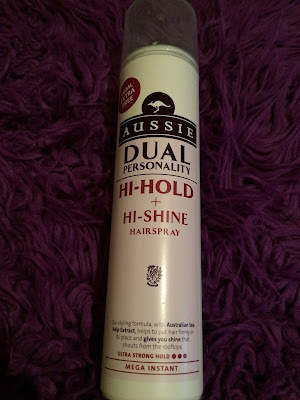 If you're looking for a hairspray which is medium hold and a dream to use, then go for this one. It does add some shine to your hair but this wears off after a couple of hours. Aussie hairspray isn't harsh on your hair whatsoever - your hair shall remain free from crunchiness. It also contains Sea Kelp extract which is believed to be beneficial for the hair and skin. This is pretty cool as I often use a little hairspray to set my makeup, it sounds gross but it leaves your makeup looking flawless for hours on a night out.